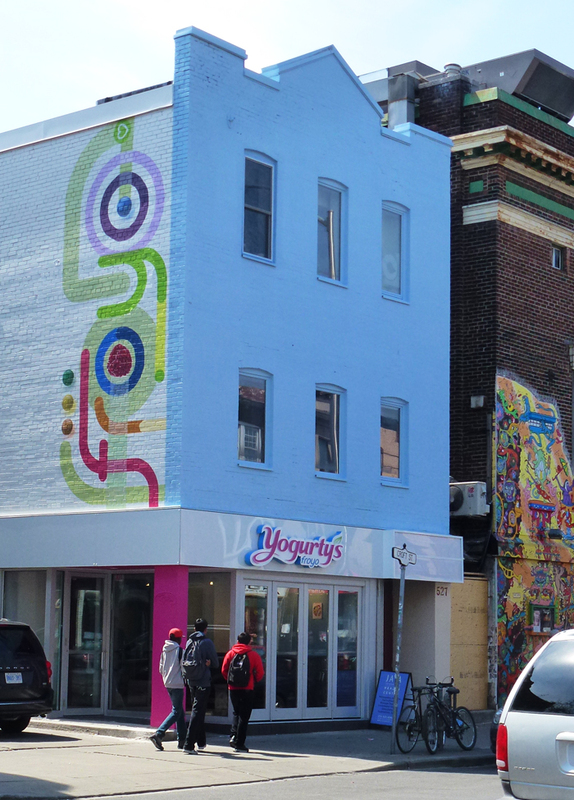 When I first saw this bright patterning that had just been painted on the side of this building on Bloor St I didn't realize that it was a sign spelling out Froyo which is part of the trademark of Yogurty's, a chain of fat-free & low-fat frozen yogurt stores. The Canadian company started in 1987 but this store just opened. I really like the spot of colour it brings to the street! Taking part in Signs, Signs. For more signs click here. we have branches of Froyo here...i like their colorful sign. They should choose this for the chain logo. It's great! Colorful! I kinda' had to do a little chair-yoga to read it at first, but I finally saw that it really did spell Froyo! I'd never miss it again. It does spruce up the side of a plain-jane building. Terrific color, RedPat. Something about it makes me smile. Thanks for your visits while I was away. I enjoyed reading your comments, even though I didn't have the ability or time to read your blog. But, now I am back! Very colourful, it would certainly brighten up even the dullest f days! Great colors. The design seems more modern art than advertising. I do not know the Froyo chain, so for me, this style of sign would make me pause to consider it! Good advertising! What fun, advertisement without being blatant advertising. Delightful. They have chosen some really snappy colors for their store. Pretty cool! I didn't realized that it spelled something until you mentioned it! it is very bright and summery looking. oh dear, it looks almost like graffiti, except that it is too neat. I like the colorful sign and the blue front on the building. Nice and bright, refreshing too, I like the building. I can see how you would miss the word. The paint job makes the place look nice and clean. That's important when you are selling food products. There cannot be many building left in your area that hasn't had a make over, either with designs or graffiti. Lovely contrasting colours though, captured well. It's an attractive, distinctive logo. Is this one of those self-serve yogurt places? I see yogurt places in most cities I visit but so far they're scarce in Vancouver. 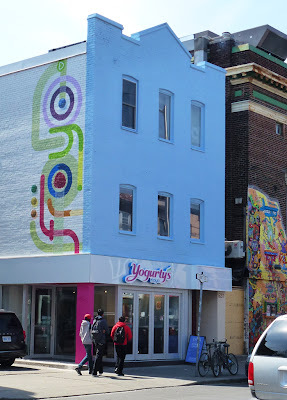 We have a couple of Yogen Früz but they're mostly in malls. I'll almost always stop for frozen yogurt. Oh well spotted Pat, even looking then I'm not sure I would have spotted it, I was sort of looking down the way note side ways..very clever! "Can You Hear It, Too?"